Starting out with a large, custom-bonded block of Precision Board Plus PBLT-4, Cosimo carved the rough shape of the bean out using a chainsaw. Next, a surform, or rasp was used to smooth out the rough edges. 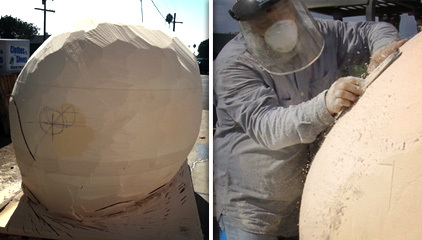 The entire bean was then sanded with 36 grit sandpaper for a smooth finish. 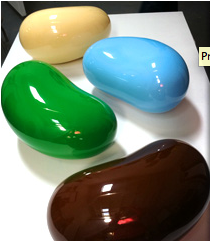 Next step in the process will be to cover the bean with fiberglass in preparation for making a 2-part mold. This will enable him to make 4 identically shaped jelly beans without needing to carve each one with a chainsaw. Once the molds are complete Task 15 Liquid Performance Plastic will be poured into them and the two pieces will be allowed to cure. They will then be removed, joined together and painted with vibrant acrylic paints. They will end up turning out as real looking as some of the smaller jelly beans he has made in the past (see left image below).